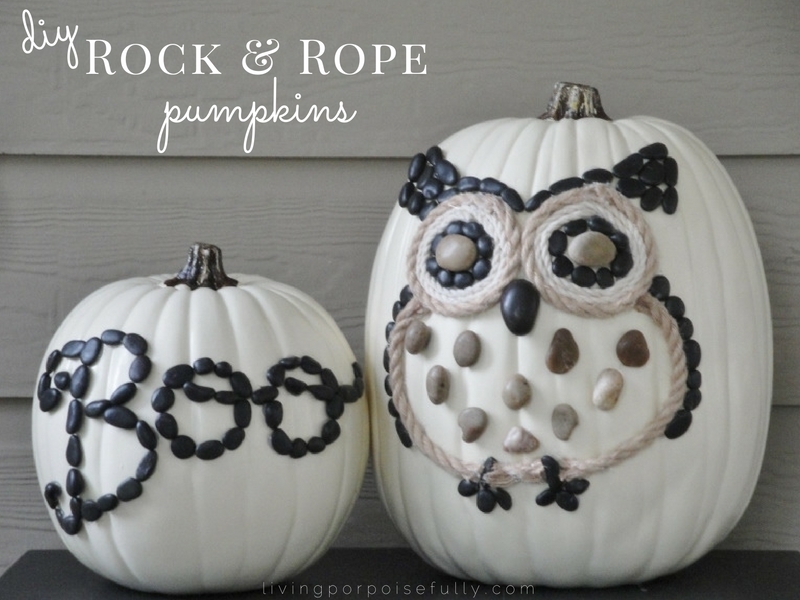 Easy no-carve pumpkins made with river rock and rope! We love Halloween. So much in fact, that we made a Halloween children’s book. But, we don’t go all out with black and orange, at least for decorating our coastally-styled house. So we set out to celebrate Halloween with a fun craft: no-carve pumpkins made with river rock and rope for a more neutral look. 2. Hot glue the river rock on top of the pencil marks. And that’s it! So simple, and it took about 10 minutes from start to finish. There was a rock or two that fell off while in the process, but it was easy enough just to re-glue. For the owl pumpkin, an autumn owl metal sculpture gave me some inspiration and helped with the owl’s features. I looked at some clip art and owl drawings too so that I had an idea of what an owl should look like! After having a vague idea of what I was going for, I first picked two large, round, light colored rocks for the eyes. Then I hot glued ONE on the pumpkin where I wanted the eye to be. With the white rope, I hot glued the end so that it wouldn’t unravel. Then I glued it to the pumpkin around the dark river rock, gluing as I went around. I went around a second time (while gluing it down), and then hot glued the cut end to again make sure it wouldn’t unravel. I repeated the same process with the jute rope, but only wrapped it one time around since it was a bigger size rope. Now that the first eye is done, here comes some super-scientific measuring. Not really! I used my thumb to “measure” how much space the river rock and rope took up. Then I moved my thumb over and marked with a pencil to know where to start the other eye. Basically, I wanted the eyes to meet in the middle. After gluing the second rock down, I repeated the above steps (small river rock followed by the two kinds of rope). Then came time to make the owl’s brow. To shape the body a bit, I glued small river rock along the sides, starting in the lower corner of each eye. I chose lighter colored large river rock to glue in the middle, and small dark river rock for the feet. The pumpkin stood up just fine on our portable fireplace, but when I put it on our buffet table, it started to tip forward with the weight of the rocks! So, I put a piece of rope underneath the front of the pumpkin to balance it. So, which one do you like better? I can’t decide. The “Boo” pumpkin was easier, but I had a blast piecing the owl together as I went. I hope you enjoyed seeing the adventure and are having a wonderful fall so far! Soo cute and unique! I love this!! Thank you! You’re so creative I love your style!